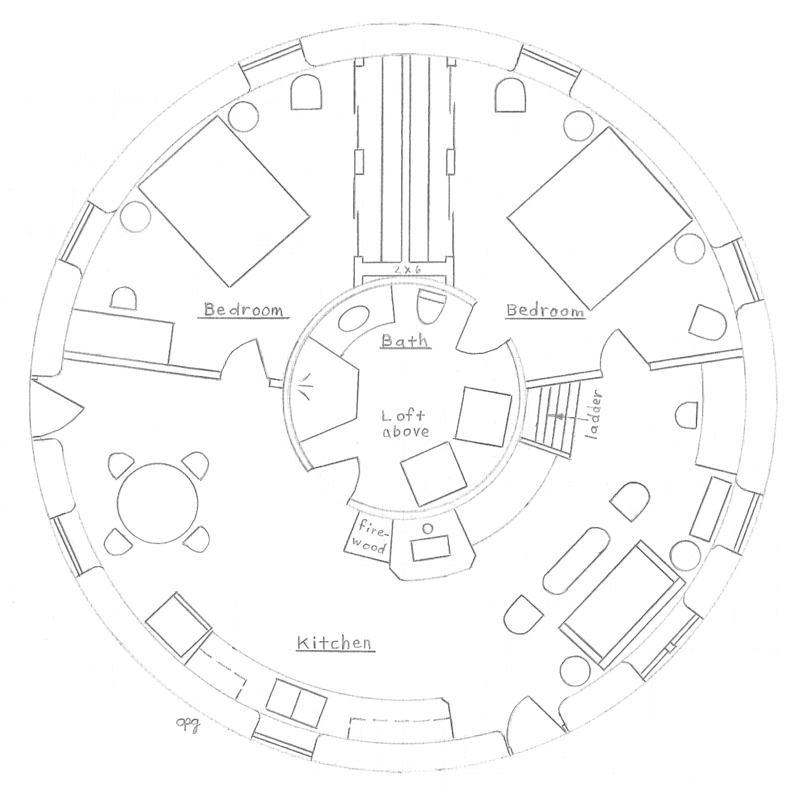 I believe this plan could be improved, as it seems to waste a great deal of space in the kitchen/dining area. Also, grouping the plumbing by putting the kitchen where the fireplace is now–perhaps moving the loft ladder to the left, beyond the bath entrance between it and the bedroom door-would give more space for the kitchen wall. The only downside I can see might be the location of a fireplace–probably on the wall of the bedroom would work. Yeah, it’s not perfect. But roundhouses are very popular and so I’m trying to offer more alternatives. Most people like to look outside from the kitchen sink and so I put the cabinets along the south wall. And sometimes it’s good to have a little extra space so people can add additional furniture. Custom plans are available for those who want something different. I still say there has to be a way to use a geodesic segment for a roof on these… Could be done like a ferrocement roof with 5-6Vs? Use a dual-layer stucco mesh and slap the gunk on! Are you familiar with: http://www.desertdomes.com/ ? She’s got a calculator on there for various vertex depths, too. It’s possible, but this would likely cost a lot of money if you build to code. It would be easier to get creative in non-code areas. And I would probably build a larger dome to create about 30″ roof overhang. You can buy prefabricated kits. Hi dear teacher I was at your workshop in koh Phangan and now I am ready to build a resort with 10-15 bangalows of earthbags round houses please help me to choose 2 project I want to buy from your plans which can be suitible for the koh Phangan island also I need a sweeming pool of the size 10-25 meters of the 1.5 meter depth. Thankyou waiting for your answer. Hello. I just sent you am email. Very nice, I like this. Still undecided about the plan I want though. How much is this plan and where can I go to purchase it. I didn’t notice this one at dreamgreenhomes.com . So the wood burning stove is also the cooking stove? I would like to see a view of the exterior. Thank you. Thanks. Kelly hasn’t added this to his site at Dream Green Homes yet. All I have to do is send him an email and he’ll make it available. The stove is actually in the kitchen (sorry, forgot). To see the exterior, just click on one of the other 10 meter roundhouse designs. It’s very similar. I am going to be building approximately 2-3 earthbag homes for a small-scale resort type location, but very specifically low-energy. I think this plan is quite good, but I was wondering if you might be able to do some custom plans to add a few other specifications? I am also curious if you might have a general earthbag ebook available for purchase. Hi Hideo, You can email me at strawhouses [at] yahoo.com for more information. The best book on the subject is Doni and Kaki’s Earthbag Building: The Tools, Tricks and Techniques. Or you can glean almost everything you need for free from our websites.